This is a common Philippine endemic. There were many trees in flower along the road in the Sierra Madre. It was fun to watch this bird stuffing its bill with the flowers! 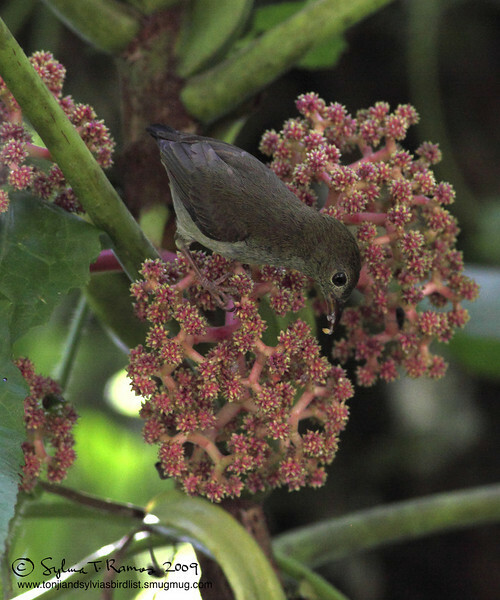 They would arrive at the flowers along with the Yellowish White Eyes. There are 5 races that form 2 groups. One group is olive above and greyish olive below. The other group is dark brown above and greyish white below. The first group is made of cagayanensis (northeast Luzon) and obscurum (Catanduanes, central and southern Luzon). The second group is made of pontifex (Biliran, Bohol, Dinagat, Leyte, Mindanao except Zamboanga Peninsula, Panaon, and Samar), mindanense (western Mindanao, Zamboanga peninsula), and hypoleucum (Basilan, Bongao, Jolo, Mulamaui, Manuk Manka, Sanga Sanga, Siasi, and Tawi-Tawi).